The scaling of the diagram, and the positioning/ordering of the labels are completely arbitrary. It's my own idea, I don't know if it has any validity, or indeed whether others have already documented these relationships in the past. 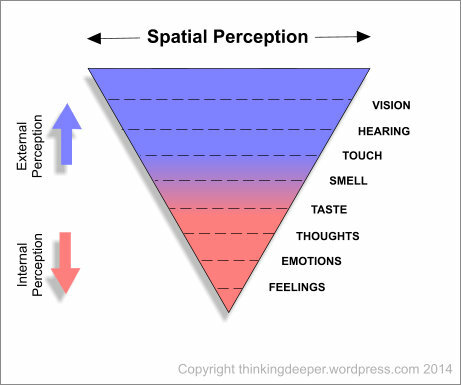 At the time, I just found it interesting that starting at the top of the diagram with 'vision', you could perhaps order the senses according to their decreasing sense of space, so 'vision' would perhaps have the greatest sense of space, whereas perhaps 'feelings' might have the least sense of space. When you order them as I've done in the diagram they move from the external to the internal. So that 'vision' gives a truly 'external' perception... 'touch', 'smell and 'taste' move closer into and around the body... and 'thoughts', 'emotions' and 'feelings' are 'internal' perceptions. So, thinking about the labels on the right hand side of the triangle... during wakefulness, do you have a broadly similar sense of decreasing space/spatial-location...? Can you go more into why touch, smell, and taste are in the order they're in? Because I associate touch with the demarcation between Self & Other, whereas smells are more arbitrary with regard to their spacial location when they're not accompanied by visual confirmation of a scent's source. I also wonder about how sensitive each of the five senses are to one's subjective evaluations. For example I've heard wines taste better if you think the vintage is impressive. I struggled with the ordering of 'touch', 'smell' and 'taste', you can put them any way you like... but I generally felt their spatial location/sense of space was less than 'vision' and 'hearing'... but more than my 'thoughts', 'feelings' and 'emotions'. ¿Can the pyramid be inverted in the case of time? I usually see thoughts/emotions are by force being always temporal, while I can see a "fixed" vision in my head as being timeless, or a fixed permanent sound. I was heading towards including a temporal element... (although you've broached the inverse time issue rather faster than I expected...) here's a slightly later diagram than the one I posted above, which helped me to think about the relationships both spatial and now also temporal... it's an oddly shaped 3D object, but you can see time represented on one face, and space represented on the other. I added the temporal aspect, because very broadly, I felt like you that 1) 'emotions' and 'feelings' have a strongly temporal element for a wide range of reasons; 2) priming studies which seem to show that past brain states can strongly influence present brain states when 'thinking'; whereas I tend to find that 3) my visual perception can quickly move from one scene to the next with relatively little 'noticeable' influence from past visual states. I also found an intriguing inverse correlation with the temporal aspect of the diagram, with some of Elendur Harraldsson's statistics (below). 1) I initially ordered a number of different general perceptions during wakefulness in descending order of their sense of 'space'. 2) I now ordered the same perceptions according to their sense of 'time' - they seemed to be inversely related to their sense of space. 3) When I combined the spatial and temporal ordering of each perception into a single 3 dimensional object, I ended up with something that looks rather similar to 'space-time'. For example, moving from the bottom of the diagram to it's top, you can see time becomes compressed, whilst space expands - and vice versa. Now I don't know if there is any validity to this. But when I noticed it last year, I found the idea that these perceptions could be ordered in their sense of 'space' and 'time', and when so ordered, they appeared to be inversely related, as really interesting. Even more compelling to me was the idea that these perceptions seemed to have some relationship with special relativity (space-time). I mean why should that be, unless these perceptions are somehow related to space-time? 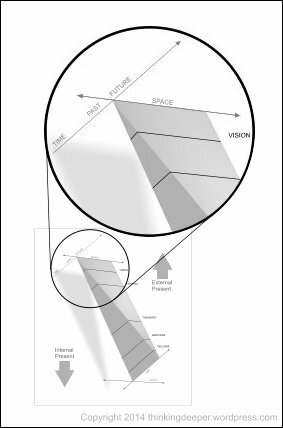 I think another interesting observation is the top of the diagram where 'vision' resides, at this position 'time' is very compressed, with a corresponding massively expanded sense of space. For years I had considered 'time' in the 'present' as some type of 'slice' of the whole of time. Now, I think I was wrong. 'Time' is compressed, but it's information is not lost to us, it still exists within 'space', as 'matter'. I think from a visual/spacial perspective in the present, time becomes compressed and is perceived by us as 'matter'. I now believe that 'matter is the past', it's how we understand 'time' from an 'external spatial' perspective in the present. Because we know that 'matter' and 'energy' are equivalent (E=mc2), I think it's also reasonable to reverse the position above, and instead consider the bottom of my diagram where 'time' is now massively expanded, and 'space' becomes very compressed. 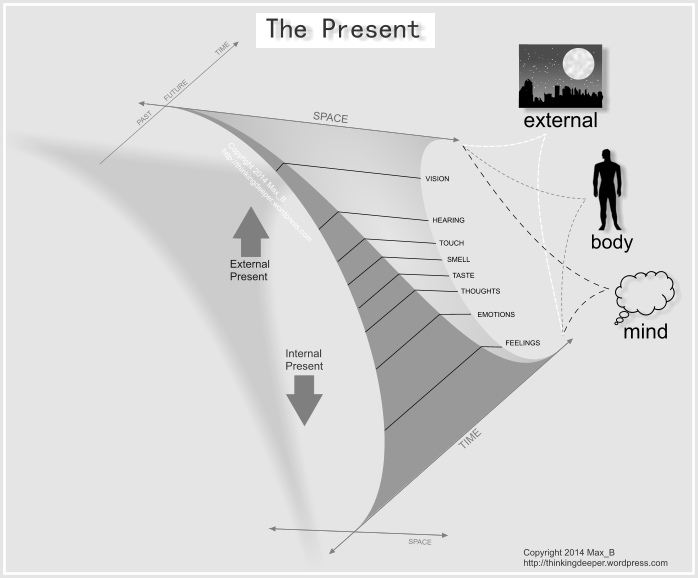 From this 'temporal' position in the present, I suggest that compressed 'space' would be perceived as 'energy', which is how we understand 'space' from a 'internal temporal' perspective in the present. So when you next look at and touch the architrave around a doorway, look at and touch the bark of a tree, or 'click' a light switch on... you might consider whether you are looking at and touching the 'past' - our way of understanding 'time', the calculation of everything that has gone before summed right to the present. Here's a later diagram from a few months ago, which I used to help me understand my 'present'. It's meant to better illustrate my idea that the 'external world', 'my body', and 'my mind' are not separate things, that they are probably just different perspectives of the same thing, something which underlies my reality, and to me, this seems informational in nature. I've pointed out that I believe that 'time' is perceived as 'matter', when seen from a 'spatial' perspective, and vice versa, 'space' is perceived as 'energy', when seen from a 'temporal' perspective. 1) Movement of information in the same space, can only take place across time. As I've suggested that 'time' is perceived as 'matter', I think you might begin to see why we generally experience information consistency between one time period and another time period, as our common perception of 'matter'. 2) Movement of information in the same time, can only take place across space. You may be able to see why we experience general consistency of information between one spatial location and another spatial location, as our common perception of 'energy'. This is great stuff Max - thanks for sharing these ideas. I can't say I am grasping all of it, but I am definitely reflecting on these concepts. Lots to think about. ...if you have any questions though... I'll try and find a way of answering them. You are saying that Information is what exists, and that space and time are two ways of perceiving information, just as matter and energy are two forms of information. Matter as we see it is essentially a summation of all information throughout time, processed by our minds, and the result of this temporal processing is projected as spatial information. So then, I also assume that means that the summation of all material information, processed by our mind, becomes our perception of time at this instant? As your chart shows, the visual system is best at perceiving space/matter information, while the internal feelings and emotions are better at perceiving time/energy information. Feelings (or energy?) tend to persist in time, matter tends to persist in space. Is that mostly right so far? So point 2...Movement of information at the same time takes place across space...that would be information as time existing across matter? So the temporal information remains consistent while the material changes? I'm just having a hard time picturing what that means. Can you give an example of point 2? BTW Max, I have been reading your posts for a while, and I appreciate that you are doing some very original thinking. Thanks for sharing. I'll deal with your last question first. Rules 1) and 2) probably only apply 'Externally', that is 1) information space to space is 'compressed' across time (matter), so 2) information time to time is therefore 'stretched' across space (energy). Why didn't I make that clear? Because until you asked the question which you directed towards an 'internal' perspective, I didn't actually realise that 1) and 2) probably only apply 'externally', and I've spent the last 4 hours wracking my brains to get to that conclusion. It's important, because the compression/expansion of time vs space is reversed at the bottom of the diagram (internal), compared to the top (external), so things are probably different. "information same-time to same-time is 'compressed' across space, so information same-space to same-space is therefore 'stretched' across time"
You have a constant, which we perceive as the speed of light, this constant is the speed (if you will) that you can calculate/process information. If you need to process more information, you can't do it any quicker, so time expands and space contracts to allow the processing to take place, but the constant stays the same. If you are in what you perceive as empty space, and move towards what you perceive as a large planetary body (mass? ), you are calculating/processing the huge amount of past information which you perceive as that body right up to your present/past observation (basically Quantum Mechanics). As a consequence of the calculation, time expands slightly and space contracts (gravity). The more information you need to calculate/process, the more time expands and space contracts. An extreme version would be a black hole. I don't know if that makes any sense to you? If you "look" at the moon, then your mind processes all the moon information from the beginning of time and projects it as visual information (a glowing white ball in the night sky). But... you don't have access to the intermediate states of the moon's history, even though you are processing them to arrive at the end result. For example, I can't "see" the moon as it looked 4 Billion years ago (even from the same spatial location), although what I do see includes that information as part the calculation. Perhaps we can't access these temporal states because the 'visual' sense is almost purely spatial information in your chart. 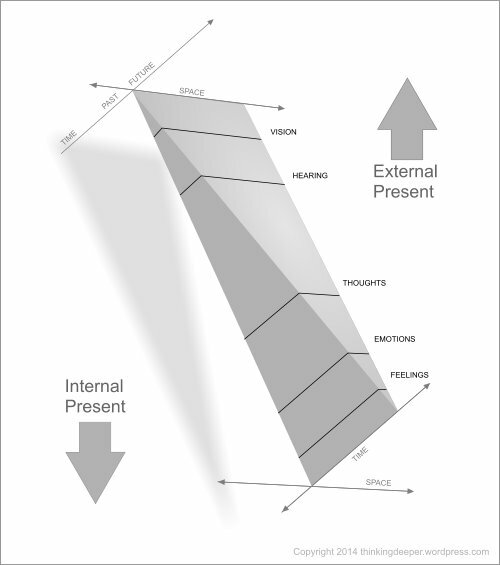 Following that logic to the other end of the chart, the internal, perhaps our feelings or emotions can access past states of time in a specific location. I've heard some people say that when they are at a site of some historic tragedy, they can feel it somehow, a feeling of unease or sadness. Perhaps this is why? 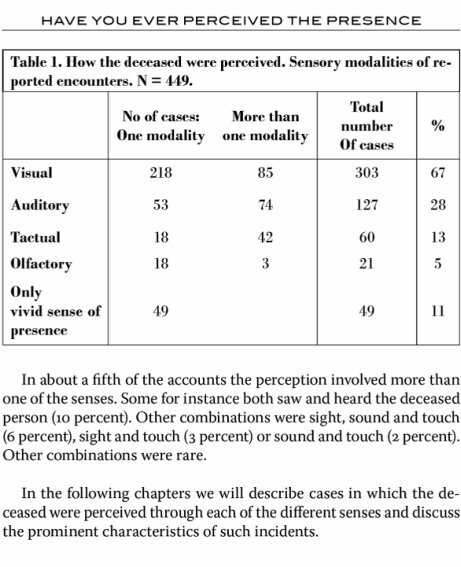 Another implication of this is that many of our scientific practices are entirely inadequate for exploring the temporal (internal) end of the chart - We measure everything using the senses on the spatial (external) end. For some time I had been working on spatial patterns and their meanings. Within the diagram you can generalise 'pattern' as the top part of the diagram (external), and 'meaning' as the bottom part of diagram (internal). It had already seemed relatively clear to me that pattern & meaning cannot be usefully separated, if you have one, you have the other - the diagram seems confirm that. I had realised that 'externally', if you wished to pass information usefully into the future within the same general space, you could only do so if you encoded it within spatial patterns of matter. I believed that our ability to manipulate spatial patterns of matter, so as to pass information across time was crutial to us becoming smart. The development of the axe, drawing pictures on the walls of caves, the development of writing, all seemed to be examples of us learning to encode information within patterns of matter, so as to allow information to move through time. After a while, I realised that this is what 'matter' must be... 'time', that was why we were able to manipulate it to move information across it. I also realised from written language, that the 'meaning' of the patterns can change, eventually even becoming lost. I believe we have struggled to deal with that, and found ways of encoding the patterns within other patterns, and structures to check their meanings. So I think you are right, it is all to easy to 'blind' ourselves to information at the top part of the diagram (external), which results in no useful information in the bottom part of the diagram (internal). Some scientists then use those results to claim that nothing else is going on. This may be usefull for your model Max_B (http://www.ncbi.nlm.nih.gov/pubmed/1203645). Thanks... couldn't get any access to this paper, but found a couple of more recent ones on the same subject. Every time I look at my last diagram (above), I can't help seeing each flat end of the object as connected to a spindle, allowing each end of the object to rotate around the spindle, with each spindle orthogonally aligned with the other. Each time I see that, I can help but wonder if there is some relationship with a pair of orthogonally aligned cell centrioles, Bear in mind, that there is plenty of research which indicates the centriole is vital to a cells ability to navigate in space-time. 1) Microscope photo showing cell centrioles orthogonally aligned, with diagram showing my object rotating in two different orientations. At the extreme of each end of my diagram it's all 'space', or all 'time' (infinate? ), and I can't think of a better way to encapsulate this idea, than by spinning each in an endless circle. I've also added an alternative at 2), and another way to think about space-time and visualise my diagram at 3) the idea being that rotating the cylinder clockwise causes 'space' to expand whilst 'time' is compressed, and vice versa. In all these ideas is the sense of circular and cylindrical motion, spinning, spiralling etc... anyway, I enjoy thinking about these things, and somebody else may find these ideas interesting.